It's been a spell since I have posted! My brother called me this morning to see if all was well and we had a very nice chat!! Time goes by so quickly and sometimes there just isn't much to blog about at my house. Today is one ginger-peachy day after a period of gloomy rainy weather. The bright blue autumn sky is just gorgeous and it is a perfect day for the last day of summer!! Autumn begins tomorrow! 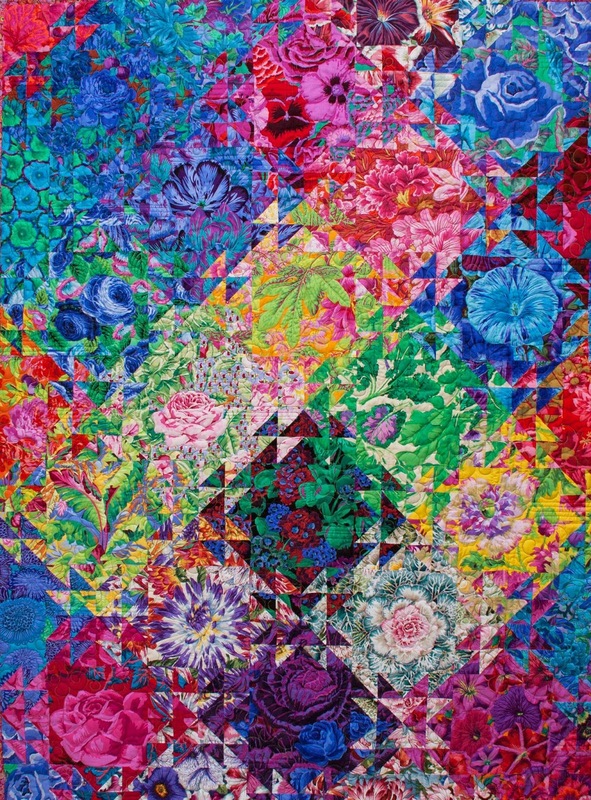 I think the quilts I show here are called Shimmering Triangles and I am really fascinated by the cool illusion. It really does shimmer! Those are from the internet. 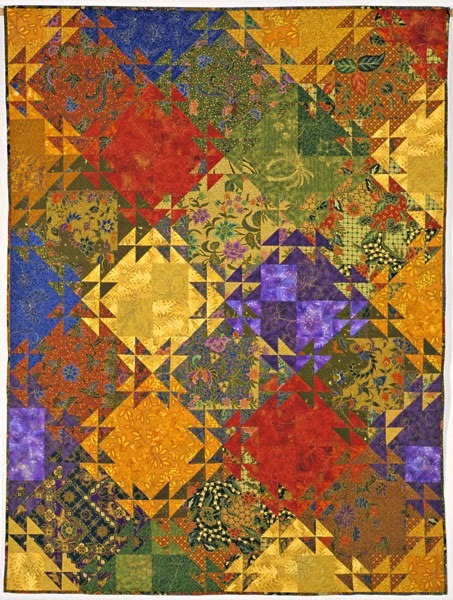 Have been searching the web for the quilts and trying to find a pattern. 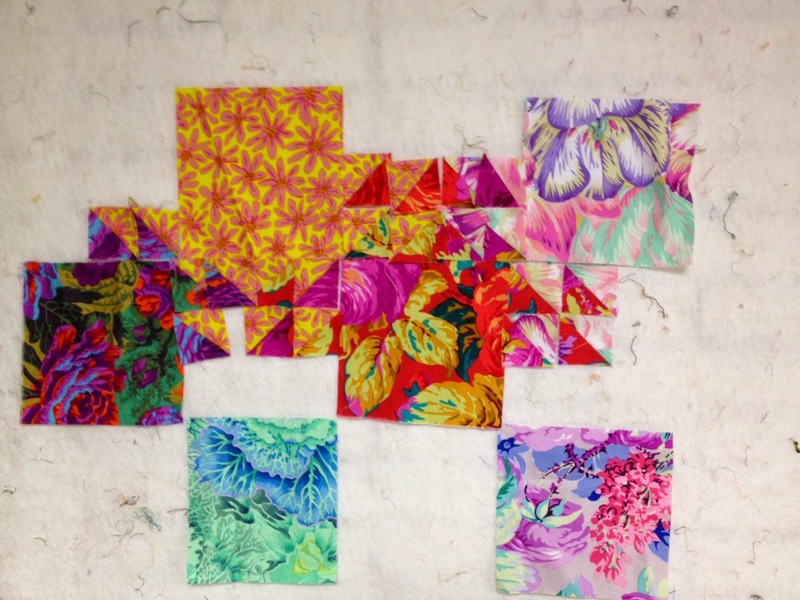 Have found several pictures of quilts and some in the making, but no pattern. I have been able to figure out what you need to cut of each fabric and also a formula for a quick method to make 8 half square triangles at a time. This is what I have on my wall so far--not enough to see any shimmering yet. This is just a test run and will be a wallhanging. I have not planned the colors too well but just want to see what happens. I think one done in batiks would be gorgeous. Still working on my flower garden two and have the little baby quilt ready to have the borders added. Bought the perfect backing for it and will how that later. Hannah, my youngest granddaughter, is in Midland with Ian, her fella!!! It's so good to see them. Ian goes back today but Hannah will be here until Thursday. She and I will do a movie and dinner on Wednesday. They are both on break from school. Twenty percent done on her way to being an RN. We facetimed with the other two girls last evening. Annie was asleep but the two little ones in Denver were up and running. So fun to see them. Friday I will be going to Birch Run with Kathy to the Quilt Expo that we went to last year. Have some quilts in it. There will be vendors and it promises to be a good time. Weather looks good. Even though we had a nice summer, I am using this as a word for today as it is so the way I think!!! I've been entranced by those Shimmering Triangle quilts too -- that Kaffe one is gorgeous and I see you are using your Kaffe fabrics too - great choice. 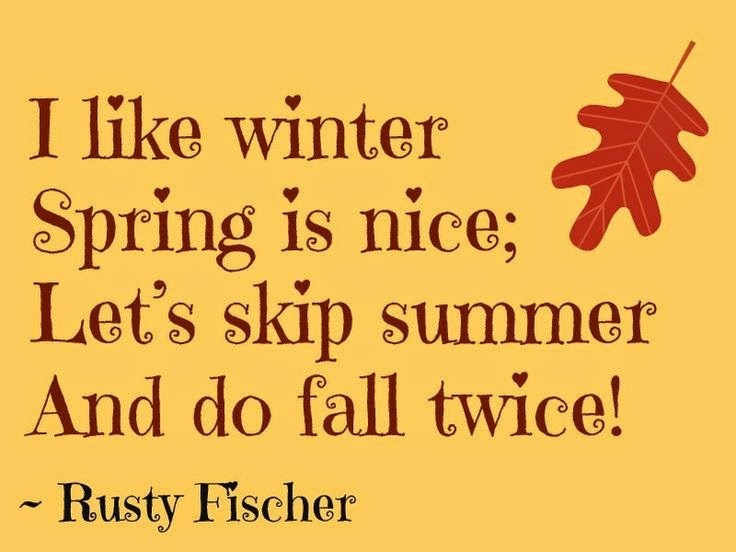 I LOVE that quote about Fall - I hope you don't mind but I'd love to borrow it and post it on my blog too - I totally agree with the sentiment. Fall is my favorite time of year! Have fun at the quilt show - hugs!